Mental Math is the greatest way of teaching math facts because it teaches automaticity which means that kids are performing equations quickly and efficiently. Additionally, when you take the time to teach students a variety of mental math strategies, you are equipping them with the skills that they need to develop their own strategies and solve more complex math equations. When I first released the Mental Math Strategy Collection, I had a few people asking about which order the units should be taught in. To answer this question, I have created the You Tube video below. The video briefly explains each of the addition strategies that I’ve included in the collection, the order that I recommend teaching them in as well as some tips for managing your time when teaching. If you have purchased any or all of my mental math units, this video is definitely worth watching! Even if you haven’t purchased my units, but do teach mental math in your classroom, I hope that you will gain some useful tips from this video. If you’re not up for watching a video today, I have included the entire write up below the video so that you can read through at your leisure. so grab a cup of coffee, and let’s talk about math! Enjoy! 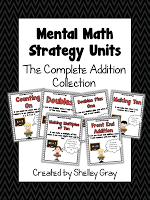 The addition portion of the Mental Math Strategy Collection consists of six units: Counting On, Doubles, Doubles Plus One, Making Ten, Making Multiples of Ten and Front End Addition. Although there are more strategies out there that you may want to teach, I consider these six to be the most important. 2. Doubles – Doubles is the next strategy that I recommend teaching, as it usually comes quite easily to students. Doubles are all around us; think of fingers and toes – 5+5, wheels on a car – 2+2, or the eggs in a carton – 6+6. When students know their doubles well, they should no longer have to think about the equation to solve it. Rather, the answer becomes automatic. This means that the student has developed automaticity. For example, when a student sees the equation 8+8, he should know that it equals 16 without even stopping to think. Building a strong foundation of doubles will help students with the next strategy, Doubles Plus One. 3. Doubles Plus One – This strategy is a natural progression from the doubles. It includes using a known fact and building on it. For example, in the equation 5+6, a student could think, “I know that 5+5 makes 10, and one more makes 11.” This strategy will likely require a bit more teaching than the previous two, but it will be well worth it; when students know their doubles and doubles plus one facts, they know 25% of the addition table!! 4. Making Ten – The making ten strategy involves memorizing the number combinations that add to ten. This includes 7 and 3, 8 and 2, & 5 and 5. Again, it is important that students develop automaticity with regards to these facts so that when they see a combination, they quickly know that it is a making ten combination. Once students begin to use this strategy, “counting on” becomes unnecessary in some circumstances. 5. Making Multiples of Ten – This strategy is a natural follow-up to making ten, as it uses the same number combinations in a different way. When teaching this strategy, students will learn to use the making ten facts in equations such as 27+3. In this case, students will see the ones digits and realize that 7 and 3 make 10, so 27 and 3 makes 30. 6. Front End Addition – This is perhaps one of the most powerful mental math strategies out there. Front end addition involves adding numbers from left to right, eliminating the need for carrying. Don’t dismiss the importance of teaching this strategy if it is an appropriate curricular expectation for your students! It will transform the way that they add, making them efficient and effective. Although many parents and some teachers are unfamiliar with this type of addition, it can transform people into believers pretty quickly! I have written another blog post all about front end addition, which you can see by clicking here. Now, for the next part of this post…how to manage your time while teaching all of these strategies! First things first, you need to understand why you are teaching mental math. Think of each strategy as a tool that you are giving each student for their tool kit. Once students have all the tools, they can decide for themselves which one will do the best job. However, in order to choose the most effective tool, they must have a really good understanding of how each one works. This is why it is so important to help students develop mastery at one level before moving onto the next. Developing mastery means that students can efficiently perform the strategy without uncertainty. So, if you are beginning with the counting on strategy, stick with it until you see mastery happening. Then it is time to move onto the next one. However, once you move onto the next strategy, in this case doubles, you still must take the time to reinforce counting on skills. One way to do this is to put an equation on the board, such as 3+3, and ask students whether counting on or doubles would be the most effective strategy for calculating this equation. Have students explain their thinking. Hopefully, in this case, they will choose the doubles strategy and begin to move away from counting on. The fact that you want students to develop mastery at each level might mean that you spend all year teaching these mental math strategies. But that is okay! It is much better for students to be really good at a few strategies than to be so-so with many strategies. Another way to continue to reinforce learned skills is to include old math centers in your center rotation. For example, even though you may be teaching the making ten strategy, there is no reason not to include a doubles center, or play a doubles game in order to keep these facts fresh in students’ minds. One point that I really want to take the time to address is using mathematical language in your teaching. If you use these words, they will too! Use words like “sum,” “addend” and “strategy” ALL the time when you are teaching addition strategies. Teach students to use the term “most effective strategy” or “most efficient strategy” when they are talking about math. When they see an equation, you want them to think about which strategy would be the most effective or efficient. Ask them why. For example, in the equation 7+6, students should realize that doubles plus one is more effective than counting on. If you begin to make mathematical discussion part of your everyday routine, you will likely begin to notice students developing their own math strategies, which is exactly what you want to happen! When you have provided them with a solid foundation, students will naturally use what they know to invent other strategies that work well for them. And seriously, how great is that?! Even if you don’t understand a student’s thinking, if it works for them, then that is fantastic! This means that you should not be forcing students to use one specific strategy once they have mastered all of them. Once learning and mastery has occurred, then allow students to use the strategy that is most effective for themselves. 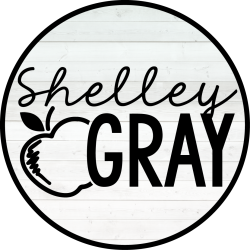 UPDATE: NOVEMBER 2015 – I have created a Math Station that strategically teaches all of the mental math strategies from this post, as well as many others. The Addition Station is self-paced and student-centered so that students are always working to their full potential. Read more about it HERE. I love your blog and math strategies. I am trying to improve my math instruction this year and your strategies are great! Thanks for all the ideas. These strategies are great…they should also be taught to the parents, so parents can better support their children’s learning. greaj job. play some more interesting games online: http://www.darkagewars.com. 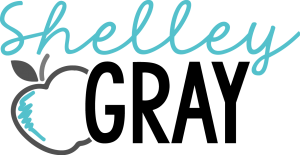 Awesome strategies and I enjoyed reading your blog. Great! Love me some additional mental math. Lovely strategies. Good collection of all the mental strategies. Gonna try in my class.